Flotation device researchers Julie Sorensen, Rebecca Weil and Judy Graham (left to right) get feedback from lobstermen Jeremiah Felix, Bryan Butler and Tim Butler in Seal Cove, Maine. The Atlantic off the coast of New England is not a forgiving force. Water temperatures in the three miles from shore where most lobstering is done only reach the low 60s in the summer. They’re close to freezing in the winter. Although some fishermen leave lines trailing behind their boats to help them get back into the vessels if they fall in, it’s not much of a guarantee. If they are working alone, they could be stranded. In fog or rough seas, even having a partner aboard might not be enough. Commercial fishing eclipsed logging as the most dangerous occupation in the most recent annual U.S. Bureau of Labor Statistics workplace fatalities report. These hazards are one of the reasons commercial fishing eclipsed logging in the most recent U.S. Bureau of Labor Statistics report on workplace fatalities as the country’s most dangerous profession. For other types of fishing, something happening to the boat is the most common reason fishing workers die. For lobstermen – afloat in low-sided smaller watercraft sometimes loaded with lobster “pots” – falling overboard is the leading killer. Yet despite the hazard and the extra time that a lifejacket will buy them, lobstermen rarely wear flotation gear. “Two years ago when we went to the Maine Fisherman’s Forum, people were very nice and welcoming, but they said, ‘We hate them and we never wear them and they’re too uncomfortable and we can’t work in them,’” said Rebecca Weil, research coordinator for NEC. 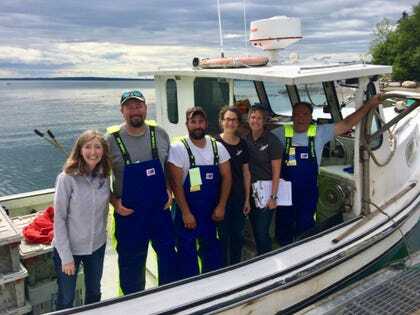 Weil and her colleagues are driving vans full of flotation gear along the coasts of Massachusetts and Maine this month through November in hopes of matching fishers with equipment that will work for them in a uniquely hazardous environment. To the degree they succeed, it will be because they invested themselves in learning from the lobstermen, and respected their expertise and opinions. Fisherman Alex Valerio sizes up a lifejacket dockside in Beverly, Massachusetts. In most industries, from farming to paper-making, technological advances and improved designs have engineered away many of the structural hazards that used to kill workers. Tractors and forklifts have reinforced driver compartments. Riding lawnmowers have “kill switches” that turn off the blades if the operator leaves the seat. Construction workers several stories high wear harnesses comparable to those used by climbers scaling the highest rock walls. Much of the engineering has been done. Owen Nickerson, Ema Hawkes, Gary E. Hawkes, Gary Hawkes and Corydan Hawkes try out different personal flotation devices in Cundy’s Harbor in Harpswell, Maine. NEC has worked over the last few years to understand what lobstermen need and their rationale for not wearing lifejackets. In 2016, Weil, Sorensen and three fellow researchers published a research paper based on interviews with 72 lobstermen. They found three reasons they don’t wear lifejackets. Comfort and workability. Lobstering is long, arduous work done in close quarters. A thick lifejacket makes it tougher to move and to look down at the line, the trap or the boat’s wheel. “I don’t even have one. I don’t have one aboard the boat,” one fisherman said. “I tried one years and years ago. I see the observers come aboard and they put theirs right over their oilskins and they can’t even move.” The wrong PFD could also create a risk of entanglement or snagging that could itself pull someone overboard. The team from NEC is tackling the issue of comfort and workability in hopes that stigma and “risk diffusion” will decrease as PFD use increases. Two years ago, the team recruited 181 lobstermen in Maine and Massachusetts, randomly assigning them one of nine flotation aids to use while working. They were asked to work the gear hard and to send feedback after a week and after one month. Studies in other industries have found the importance of what behavioral economists call “idiosyncratic fit” – adapting solutions to the individual needs and preferences of a worker – and the power of worker “voice” – getting to make decisions for oneself rather than having them dictated. Both seem especially relevant to the deck of a lobster boat. In the NEC vans are belt packs, bibs, shirts and vests that made the cut. Most are Coast-Guard-certified. Some are not, but were requested by those who did the testing. Fishermen can buy them at a 50% discount. Although Weil cautions that the early evidence is anecdotal, the reception so far has been good. The “Lifejackets for Lobstermen” Facebook page has a number of fishermen asking if one of the vans is coming to their port. And the lobstermen they have met and outfitted have been grateful. The team is beginning to assemble a collection of photos that look as though they came from the L.L. Bean catalog. “This year when we went to the Maine forum we had close to 150 lobstermen trying on lifejackets and saying they really wanted these and they were really interested in the designs that we found,” she said.